Bullying someone is no way to go about living. It's a lot of work to be a bully and it makes life for the bullied even worse. Putting that much time and effort into making someone suffer is never a good idea; especially when that someone decides to fight back rather menacingly. That's the situation some bullies encounter in Cutter #1 from Top Cow/Image Comics. The issue is written by Robert Napton and Seamus Kevin Fahey, illustrated by Christian DiBari and lettered by Troy Peteri. Jeremy lives a quiet life with his wife in a rural town. Successful and stable, Jeremy is the guy next door. But he and his high school friends share a dark secret. And when that secret literally comes back to haunt them, Jeremy must confront his past and his own sanity as he comes face to face with a vicious serial killer..."The Cutter." While reading Cutter #1, you can't help but feel the story is slightly familiar. That's because it is. Napton and Fahey's tale is a little recognizable from a high-level, as it's really just a story of revenge (much like Carrie). It's told mostly through Jeremy's perspective and his psychological unraveling at the murders around him is pretty unsettling. The book doesn't feel like it has a supernatural aspect to it, yet it's likely that's where Napton and Fahey are taking it based on the direction of some of the characters. Their dialogue makes it feel as if Jeremy is conducting an investigation--which he is to some extent--and effectively brings the reader along at a relatively moderate pace. There are some clichéd events that try to ratchet up the horror which do feel as if they interrupt the mood slightly. There's a roughness to the illustrations that is owed to DiBari's choice to stick to black and white. DiBari infuses his work with a certain level of Bernie Wrightson terror, as the facial expressions of the characters depict plenty of intricate detail. The Cutter is illustrated with a certain ethereal quality that does lead the reader to believe that maybe there are hints of the supernatural at play without blatantly tipping in one direction or the other. Each character stands out very cleanly, with little to no emphasis placed on embellishing the setting behind them. The black and white finish also adds a sort of noir feel to the book, not really allowing it to be placed in any exact time or place. 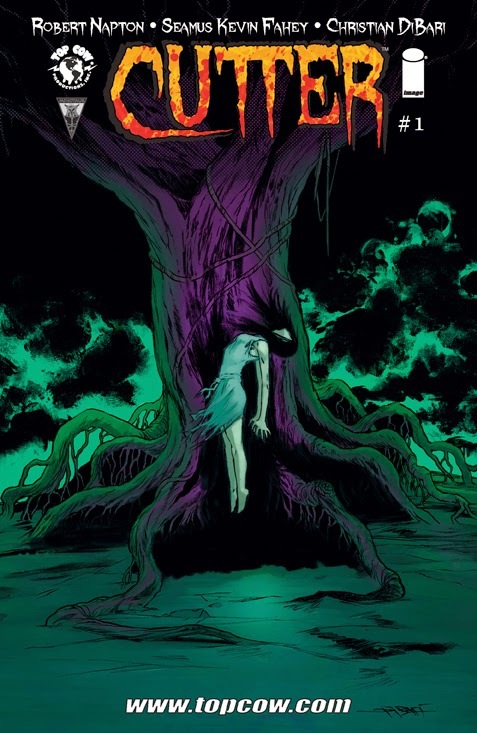 Cutter #1 reads like a campfire ghost story. The thing is that the jury's still out on whether or not there's actually any "ghosts" involved. The story by Napton and Fahey unravels very meticulously, embracing more horror in the unknown than by actually showing horrible things happening. DiBari's artwork is haunting in some ways, which again seems to emphasize an otherworldly dynamic at play. Cutter #1 is a slightly terrifying first issue that really wants to delve more deeply into a terror of a killer with giant shears. Cutter #1 is in stores now.